Late last fall we realized that our grocery spending had really gotten out of hand, even though we increased our budget from $360 to $400 per month. In November we spent $484 and set ourselves a grocery challenge – several goals that we thought would help us reduce our grocery spending to under our budget. The first month of our challenge, December 2012, was not successful – we spent $502 – but I was feeling hopeful about our strategies. Our philosophy of budgeting is not necessarily to use our budget as a restriction to spending but rather to help us plan and make sure that our spending and saving is balanced. So it could be the case that we just need to spend more on groceries and we need to increase our budget, or it could be that our spending is out of line here and we need to find a way to cut back. The main problem is that I don’t eat certain foods that happen to be inexpensive that other people might turn to reduce their food spending, such as potatoes, rice, and corn- and wheat-based products. Kyle thinks that if I were serious about cutting back on grocery spending I would turn to these carbohydrate-heavy alternatives since they would not cause an immediate health crisis, and I suppose that is true – I do value my health more than going over our budget by 25%. But that doesn’t mean that I can’t try to meet my nutritional goals and stay in budget some other way. That’s what this challenge is really for – I didn’t have all the answers on how to do this up front but I’m learning more from paying additional attention. I have observed that shopping only once per week is not necessarily helping us spend less. The idea was that if we let ourselves run out of a few items each week we would be forced to eat down our fridge and pantry in other ways and maybe even reduce waste. The way it has worked out is that I never let myself run out of an item, which means that I have the potential to overbuy if I don’t know exactly how much I will consume. This is even teetering on generating more waste as sometimes I buy produce that I don’t even start to use for 5 or 6 days. I think in the future we may relax our Saturday-only spending. Our natural Costco visit frequency is more like once every 1.5 weeks so we’ve been going more often than necessary recently. One solution I thought of to combat the overbuying (other than shopping more often) is to actually engage in meal planning, which I started to dabble with that in the latter half of January. I never thought meal planning was for me because I just cook for myself and eat more or less the same stuff all week. I wasn’t great at it at first – the meal plans got derailed around halfway through each week and I had to retroactively edit. In the second week into February I’m not a bit better at sticking to the plan and I think it is helping me reduce the amount I buy each week. This is my meal plan for this week, for those interested. Our spending was lower in the second two weeks of January ($187.19) than the first two ($312.93) and maybe that had something to do with the meal planning. We have to see how February goes to make a determination on that part of the strategy. So what did we actually spend? 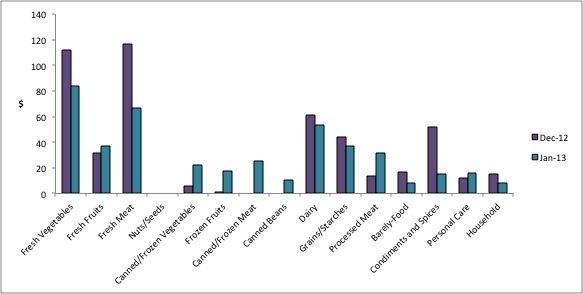 I think the general trend here is that we spent a bit less money on fresh vegetables and meat and substituted for more canned and frozen items that were likely at lower cost. We also didn’t buy a crippling amount of condiments! I am buying more fresh berries than I used to because I want a bit of fruit in my diet. Kyle also complains that I buy asparagus too often (apparently it is expensive?). I am hopeful that the meal planning purchase delaying/eliminating trend will continue and we can finally get back under budget in February. It’s a short month so we have the best chance for a while! The rest of the goals have become fairly automatic with the exception of hitting up new stores – we now have a synched app on our phones to keep our grocery list, I always check the sales (but rarely buy), etc. Is your budget a guide for spending or hard limits? What do you do when your initial strategies don’t work out? Do you meal-plan? 43 Responses to "Grocery Challenge Update for January 2013"
We don’t meal plan like that. Basically when I’m making the shopping list on Sunday I ask Mr. PoP what he wants to eat for the week and he’ll throw out a couple of ideas. I pick one that either we have some of the ingredients for or some are on sale, then I make it on Sunday afternoon. I do the same thing for my meals. The shopping trip is usually specifics for those meals + weekly staples (milk, bananas, yogurt, etc) + sale items that regularly come up. It’s not a perfect system, but by shopping and doing most of the cooking the same day it’s not a huge deal to me if I forget an ingredient. I just send Mr. PoP out to get that 1 thing while I’m in the middle of cooking. It does mean that M-F we pretty much eat the same thing every day. My dinners this week were all quiche, Mr. PoP’s were thai curry. Mrs. Pop @ Planting Our Pennies recently posted..More Family And Money: They Don&#8217;t Want It Back! What portion of your meals are composed of weekly staples and what portion is different week-by-week? I eat a vegetable omelette for breakfast just about every day – my other three meals rotate but there are lots of recurring meals depending on what meat we choose to buy. We do this as well– we have a list of meals for the week and grocery shop for that list but not what we’re going to eat on Monday vs. Tuesday etc. Then when we get home and it’s time to make dinner we look at the list and see what looks good knowing we’ll have all the ingredients on hand. It also helps us not waste anything because we’ll be like, oh yeah, we really need to eat those beets or whatever. I think I need to plan out what I’m going to eat each day because my lunch, dinner, and 4th meals are rather interchangable and I don’t want to end up eating the same thing for all 3 meals! That’s a good point about reducing mental load – maybe by the time we have kids we will be better at meal planning! Food prices have also risen this year due to weather and crop issues (in addition to the usual inflation). You may not eat corn or wheat, but when their prices go up, it actually affects meat even more than pasta or tortillas because they’re used as feed, apparently. I know that doesn’t explain a 20% increase but it does make it harder to spend the same amount of money and get the same amount of food as we used to. I’ve had similar problems with sticking to budget. I’ve also found that weekly shopping and trips to specialty stores tend to make me spend more; I used to live a couple blocks from a grocery store and it was easier to avoid over-buying when I knew I could always easily grab something on the way home from work. On the other hand, when I occasionally stop at a farmer’s market, an ethnic grocery store, or a Trader Joe’s, I always buy a few pantry ingredients or vegetables that I wouldn’t or couldn’t get at the regular grocery store, but I still need to get most of the rest of the stuff we’d eat in a week, so I’m usually over budget those weeks. I don’t know the solution though…. The price of types of meat that we buy most often from Costco hasn’t changed over the past couple years. I guess their margins must be getting smaller! We used to live quite close to a more expensive grocery store, which was nice for convenience but by driving a bit further we could have gotten much better prices. Now that we live close to a less expensive grocery store we should probably allow a return to the convenience part so we don’t overbuy. As always, I LOVE your detailed graphs. Breaking it down like that is just the best way to improve in the future. I definitely go to the grocery store about 3X/week, but that’s because it’s 2 blocks from my apartment. I have a budget, but it’s more of a general guideline than a hard stop. I think I’d have trouble staying withing my budget if I didn’t eat many carbs, so I applaud you for trying. Man, I wasn’t even eating beans for several months but I added them back in this week for my chili because of the convenience and cost! Kyle eats tons of carbs – rice, tortillas, chips, etc. – so definitely this overspending is due to my preferences, not his. I’ve been flirting with eating Paleo over the past couple years but can never commit, partially due to the cost. Yea, some of my friends are doing the Paleo diet. It seems like a good way to force yourself to eat mostly vegetables, but man does it get expensive! We can’t do the grass-fed all-organic part right now but I at least want to get the food groups in line. I guess I’m going for Primal more so than Paleo – sometimes. We (I) plan our meals on a monthly basis, and I put together the shopping lists for the week as well. Our budget is definitely more goal-based because we haven’t been working with it for very long and there are still lots of tweaks that need to be made. Something that saved us a lot of money was switching to a secondhand produce market, for lack of a better term. They’ll buy things that chain stores are ready to move off of the shelves to make room for new items. In general, we have to eat or freeze our produce within a week, but since we shop weekly it’s not an issue for us. Occasionally we’ll get a bad apple or something- but last week I paid $1 for 12 oranges, so it’s worth it to me. I wouldn’t mind buying less pretty produce if it beats Costco prices. But our CSA will be starting up again in the next few months (I think) so we won’t need to buy nearly as much produce from stores at that time. How would I find a secondhand produce market in my area? So, at least up here, the trick is that you can’t go in with a set list because not everything is equally discounted. But if you can be flexible the deals are worth it- peppers for 5 cents/lb, etc. Beats Costco hands-down. I found our through word of mouth, but I was also able to find it on yelp searching for discount produce in my area. These graphs are awesome! I love the breakdowns. Personally, I’ve found that, when buying out of season, frozen anything is almost always cheaper than fresh. I’m certain that my Trader Joe’s carries frozen berries and asparagus. Depending on how you how you like to eat them, they might be helpful substitutes until summer. My budget is definitely more of a guideline. We eat at restaurants very rarely, so I let myself have a little more flexibility with the grocery budget. I’m with you, though – we value our health a lot and that definitely drives up the spending. Alex @ Brain, Body, Because recently posted..Snowy hikes, salads. Ps – A really simple trick that helps me cut down waste is that I don’t put any produce in the crisper drawers. Instead, I put it on the shelf that my line of sight falls to most naturally, so it’s always the first thing that I see when I open the fridge. I use the crisper for “overstock” (like, if we have two cartons of eggs in the fridge, I’ll put one on the shelf and one in the crisper). That does make a huge difference! I have been buying lots of broccoli recently for Kyle to eat, primarily, and I keep forgetting to cook it for him since it’s in the crispers! Kyle HATES frozen vegetables and I have a bad track record with actually using them! Even the frozen berries I bought a couple weeks ago for smoothies are languishing because I decided not to buy whey protein. If food goes to waste it’s not worth the lower cost, so I’m trying to take buying frozen slowly to make sure I actually use the items – that is where the meal plan comes in handy. We have a meal plan for a week and we buy grocery items and foods based on our plan meal. I believe if we have a budget plan and shopping or grocery list, it will limit our overspending habits. I think the listing is working against me a bit since I’m not willing to enforce our budget, but maybe meal planning plus listing will help us bring the overall spending down. I could have written this myself. You sound a lot like me. I’m feel very different sometimes because meal plans for me do not work. I never know what I’m going to want to eat on a Tuesday three weeks from now. I’ve very picky, so shopping more often, but not letting food go to waste has helped my budget a bit. I still spend a lot (340) for just me, but I also don’t eat out hardly at all, and I choose really healthy foods. I’ve come to accept this is who I am, and I don’t spend as much in other areas of my budget, so I feel somewhat OK with it. I do try and make small adjustments each month to see if I can cut just a little bit off my budget, but I realize this has been a virtually impossible task. I have a fairly consistent/restrictive diet so I’m very used to tracking my food and whims don’t have much to do with what I choose, but even so meal-planning felt like a big jump – I suppose because tracking is retroactive and planning is prospective. I would like to spend even more on food than we do for higher-quality meat and vegetables but we don’t want to sacrifice any more in other areas. It sounds like you are more on the “my budget reflects who I am” side than the “my budget keeps me in line” side, which is mostly where we are, too. I don’t do meal plans but I do buy a few things once a week: milk, cereal, bread, & cheese. I have vegetables delivered to me bi-weekly so I don’t purchase produce at the store. My grocery spending (as a single person) is about $125/mo. That’s quite low spending! Are you a vegetarian? No, but the closest market to me doesn’t sell meat. So I usually only pick up some chicken when I’m at the second-closest store and then when it’s on sale. With that said, most of my eating-out meals are definitely meaty. leslie recently posted..What do I do with Acorn Squash? Make Muffins! We meal plan to some extent, but life usually derails us in some form or fashion. Our grocery budget is a hard and fast number and usually come in under it which allows us to stockpile some when we want. One big thing that has helped us is to only go to the store once every 10-11 days. It cuts us down to three trips a month versus four. Most of the fresh veggies will last us that long and the only fruit we might run out of is bananas and we can just buy some during the week if we like. I think shopping three big times a month would be great for us if we can allow a few other tiny trips. I would love to be able to think about stockpiling when we have some excess money in our grocery budget (as we have had over the summer). We do buy canned food fairly often (vegetables for Kyle, beans for both of us) and if I can get my act together regarding frozen food waste we could buy meat when it’s on sale. Thoughtful post. We have the same produce problem when we shop less frequently. the waste in my budget is nearly always because of this. Thankfully we haven’t actually succumbed to waste recently (starting in 2011 after reading American Wasteland we changed our habits to reduce waste) but I can see the potential is there with once-per-week shopping. I love the fact that you’ve included 4th meal in your meal plan! (I might add that now…it would certainly cut down on the “snack” part of our plan) We try to meal plan each weekend for Monday – Friday and then leave the weekends a bit more open. It saves so much time during the week when you don’t have to think or worry too much about food and I think it helps us keep our grocery budget under control. One of the things you could do is to try to meal plan around whatever is on sale that week. I like how meal planning has taken the daily decision-making out of eating, too. I have been checking the circulars for our proximal grocery stores but they don’t often list sales on items that amount to lower prices than Costco. I don’t like to buy things that we don’t typically eat because I might not know how to prepare it well, but maybe I should be more adventurous. I counted 6 different entrees for 28 meals. That monotony would drive me crazy. I have found that when I try to be too restrictive with my diet, I’m more likely to cheat. Everyone knows not to shop while physically hungry, but shopping while hungry for variety can be just as bad. Definitely switch to frozen for most vegetables; they are much cheaper. I’d also save asparagus for special occasions, because it’s one of the more expensive fresh vegetables, and few places sell it in any kind of frozen form. Yep, I eat the same things over and over and it doesn’t bother me! This particular week actually has more variety than usual as I at least alternated days – usually I’ll eat exactly the same menu for the whole day for 2-4 days in a row! It’s great for time savings as well as getting through the food we buy from Costco. I’ll start tracking prices for fresh vs. frozen vegetables; maybe I can stock up on some frozen stuff to tide us over between fresh purchases. Barely food makes up too much of my budget and if I eliminated that I would be healthier and have more money. I see chili in your menu plan. It is an excellent food because freezes well and all the food groups (except barely food) are there in one pot. Do you buy dried beans for your chili? They are such a cost saver compared to cans. I buy bags of assorted beans and prepare them according to the package directions. Just make sure to taste test to make sue they are soft before you add them to the pot. Dried bean preperation takes a long time but very little effort so I make several assorted bags at a time and freeze what I don’t use. Seasoning your bean soaking water with your favourite hot sauce or chili powder is a great way to get the flavour party started. You know, I have attempted using dried beans on a few occasions and I have never gotten the hang of reconstituting them, even after trying a couple different methods! And I doubt Kyle has ever tried. But I suppose if I end up using them in the slow cooker there is more room for error? 1) Be boring. You kind of do this already, but by eating the same meals on a regular basis you can minimize planning and maximize bulk purchase cost savings. The other trick here is to have several meal set plans as different sets of items go on sale at different times. So if eggs are on sale – keep your ommlet plan for 2 weeks, but if not then switch to oatmeal (which is great for you by the way). 2) Switch to more frozen produce – yeah it isn’t as “fresh” but the vitamin content is nearly identical, it is usually cheaper, and lasts longer. 4) Try adding more olive oil in grilling/pizza/veggies/etc. . It is very healthy Fat and is very cheap on a cost per calorie basis. 5) Start going through your highest cost per calorie items and finding alternatives that are still healthy but not as expensive. Guessing Asparagus is going to make the list, probably flax seed flour (not sure on pricing), avacado?, berries, greek yogert, etc. . . I do appreciate you adding your suggestions here so that others can read, but you are right that I’m not willing to change the type of food I eat just to spend less money. I used to eat differently and I became obese. I’m happy to spend a bit more on asparagus and berries to maintain good health metrics, and I know what works for my body after an intense year of experimentation with my diet starting in 2010. The vast majority of the time I don’t eat grains at all (that includes oatmeal, which if I were to add any back in would be first on the list). I don’t eat any fruit aside from berries, avocado, and tomatoes because of the high sugar content and I incorporate vegetables into at least 3 of my meals each day (the omelettes have >= 1 cup of vegetables in them). Kyle eats more in line with what you suggested and his food does cost a lot less than mine – but our bodies are responding differently to that kind of food, at least for now. I am going to cut down/out on eating Greek yogurt myself, but Kyle likes to have one a day with his lunches. (This is one of the effects of getting married that actually increased our expenses, and it is kind of silly.) I’ve switched back to buying Brussel sprouts ($4.29/4 servings) primary and asparagus ($6.99/4 servings) less often. This is an ongoing project and I’m glad to hear what works for your family. Perhaps in time my principles regarding my diet will change, but for now I’ll just try to keep buying what I want to buy at the lowest price I can find. Health is one of my top 5 values and I’d rather invest in quality food now (as I define it) than pay down the line when my health deteriorates. In fact, I’d love to spend even more money on food so that we could buy grass-fed meat, but that’s not in the cards yet. Obviously this is completely your personal desicion so totally cool with that. I just think you need to adjust your expectations in terms of your spending though as it is not going to change much without adjusting diet. You could look more into the excercise side of the health equation as well as if that is in place I have found much more flexibility in terms of diet. Yes, that’s true that there is only a bit of wiggle room without making different food choices. I don’t subscribe to the calorie-balance theory of weight management so I emphasize quality of food and exercise over quantity (see Good Calories, Bad Calories and The Smarter Science of Slim and anything Paleo/Primal).